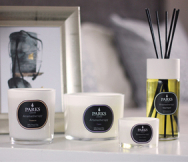 Parks Candles' Scented Candles are perfect for the home, as they spread a gentle, subtle yet deeply moving scent throughout any room, flat or single floor of a larger dwelling. Not only are they crafted from some of the finest, purest smoke-free waxes that we produce, they are hand poured into elegant glass vases which make them important visual elements that improve a space's atmosphere. At its centre is one of our finest smoke-free wicks. Made out of 100% natural cotton, it is designed to burn slowly and evenly and so never needs trimming. But the real heart of a candle is not its wick or its wax, but rather its scent. In this case, our team of world-class craftspeople have combined the essences of Jasmine, Patchouli and lemon to create a truly unique aroma that will soon become one of your favourites. Each of these essential oils is derived from natural ingredients. These are harvested responsibly and processed by using traditional methods, some of which have remained unchanged for hundreds or even thousands of years. They are then infused permanently into the wax, ensuring that the scent lasts as long as the candle itself, even if it goes unburned for many years. Jasmine comes to us from Southeast Asia and is used by many aromatherapists to ameliorate bad moods and stress. Patchouli is often used in the same way as an antidepressant, sedative and even an aphrodisiac. Bergamot and lemon add citrus notes that soothe and stimulate in equal measure.